The second in this delightful series brings us back to check in with Elliana, owner of the Scents & Nonsense shop, known for her Enchanted Garden which fuels the aromas in the perfumery, and mixes with Ellie’s special magic to bring healing, happiness and surety to her customers and visitors. Adding to the magic in the shop are Dash and Nabokov, the shop’s dog and cat, with free run of the shop, garden and Ellie’s small garden shed tiny house in back. In this story, the aromatherapy and garden’s magic take a backseat to the ongoing mystery, sparked when Ellie is informed that a national magazine wants to feature her garden shed now house as one of the unique tiny houses that are all the rage. An unexpected visit from her brother and his girlfriend bring Ellie face to face with the very grumpy reporter sent to interview her, as a flare up at dinner the night before starts her worrying. That is compounded when she hears that the man was found dead, her brother’s girlfriend is the chief suspect, and the detective isn’t known for his willingness (or ability) to actually investigate further. This brings Ellie to ask her friend (and police officer) Lupe to help her investigate the death, and look into the reporter’s family, as she discovered he had ties and family in her little town. Oh what fun and the plethora of suspects, from one twist to another, secrets pop like weeds, one after another until the culprit is revealed. Perhaps missing a touch of the magic of the first book, as Ellie is so very involved in separating fact from fiction, answering the many questions that appear until the murderer is revealed. This is a book, and a series that is best read to be enjoyed: the evocative language and description that Cattrell weaves throughout the story allows for your imagination to take hold as you feel immersed in the story, right alongside the investigation. That being said, this was an audiobook narrated by Vanessa Daniels, and as you can see with review of Daisies for Innocence, that was not the best experience. In fairness, I like to listen to a few examples of a narrator’s work, hoping to see improvements and growth in performance style. In this book, there were many of the same issues: odd hesitations without purpose that contrasted against those moments where words and sentences are rushed through. In this installment I again had the feeling that this was a chore for the narrator: one to be completed quickly, and then forgotten. While I have yet another title from this narrator in my review queue, I’ll refrain final judgment, but this was not an enjoyable listen for a book that deserved a performance that felt as if the narrator cared to perform. 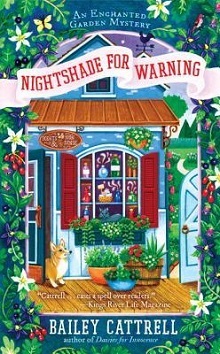 The second Enchanted Garden Mystery from Bailey Cattrell author of the "New York Times" bestselling Magical Bakery Mysteries as Bailey Cates. Elliana s business and personal life are flourishing in her hometown of Poppyville, CA since she opened Scents & Nonsense. She uses her very special skills to craft perfumes that almost magically ease heartache, inspire change, and bring joy and her customers love to relax in the beautiful garden behind her shop along with her corgi, Dash, and her cat, Nabokov. The shop is so popular that a journalist has come to write a feature about Ellie for a national magazine. But then the journalist is found dead, and suspicion falls on the last person to see him who just happens to be Ellie s brothers girlfriend. So before everything goes to seed, Ellie must rely on her powers observational and otherwise to pick out the real killer from an ever-expanding bouquet of culprits..."